Following the failure of their 250 and 350cc twins, Aermacchi created a 500cc version that was unique in that it had four carburetors, two per cylinder. 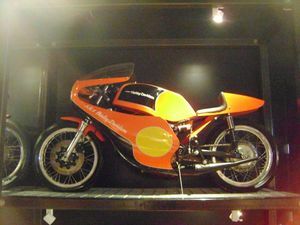 The motorcycle started in 1973 using an air cooled motor, but with the loss of their star rider, Renzo Pasolini, the factory lost interest in the project and it sat idle for two years. 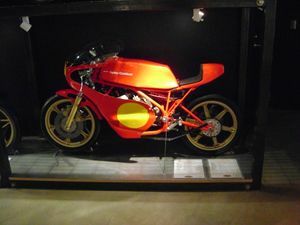 A revised water-cooled version was tried but it was never the success it was hoped to be, and the project was turned over to another Italian company, Bimota. Apart from the two carburetors per cylinder, it also has an ingenious front brake. The twin discs are gear-driver to rotate in the opposite direction to the wheel, as to what reason or advantages is not known, anti-dive, reduce surface speed of the discs, gyroscopic forces? This page was last edited on 11 August 2010, at 00:58.